Here a world conference, there a world conference. 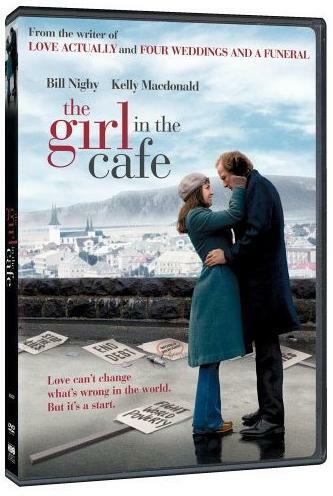 Whenever one of these big-time global confabs takes place, like COP15, I get the urge to watch “Girl In The Cafe” again. Released a few years ago, it is still strikingly relevant today. So right now would be a great time to rent, watch or purchase this DVD. After all it takes place in Reykjavík which makes it seem like a Christmas Flick. Plus it’s focused on a world conference with lots of negotiations. So the timing is perfect. … Lawrence, a 57-year-old Londoner with a successful governmental career and nonexistent social life. One day he stops in a café and meets the mysterious, considerably younger Gina (Kelly Macdonald, Trainspotting). To their mutual amazement, they hit it off and agree to meet again (and yet again). Then he invites her to accompany him to the G8 Summit in Reykjavík, where she upends his carefully ordered world in ways both wonderful and terrible. Whenever I read about a world conference this film takes me to the back rooms where the real work goes on, and negotiation either succeeds or fails. Lawrence: We get into the habit of compromising and therefore we are always compromised. Now that COP15 has just finished up on an ambiguous note, this film provides some insight into what happens at these events. Perhaps not with specific details, but certainly with the process that takes place. And Bill Nighy gives an incredible performance that you won’t forget. If nothing else, it might motivate you to get hold of a Starbucks Red Card (I did).